What are the signs of specific phobia? A phobia is characterized by persistent and excessive fear of animals, objects or situations. The intensity of the fear is out of proportion to the actual risk. For example: fear of heights is a common fear people tend to have. For someone with a fear of heights (Acrophobia), looking down from approximately 10 meters makes them feel very dizzy, faint, afraid, and they will want to leave the situation as soon as possible (‘I might fall down’). 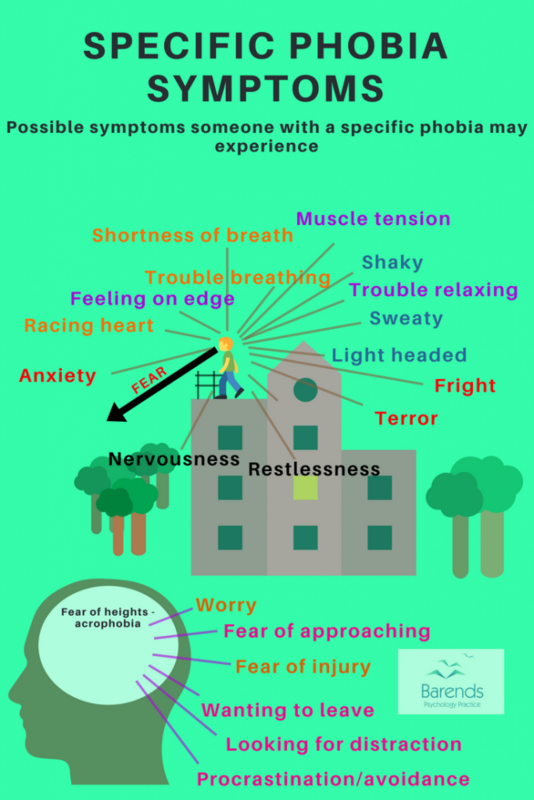 Depending on the severity of the phobia, some could already experience these phobia symptoms when they need to cross a small bridge. Other phobia symptoms one may experience are shortness of breath, racing heart, panic attack, and sweating. Phobia symptoms can be experienced on a physical, emotional, and mental level. The racing heart is a physical symptom, fear is an emotion, and on a mental level someone may want to leave the situation early. 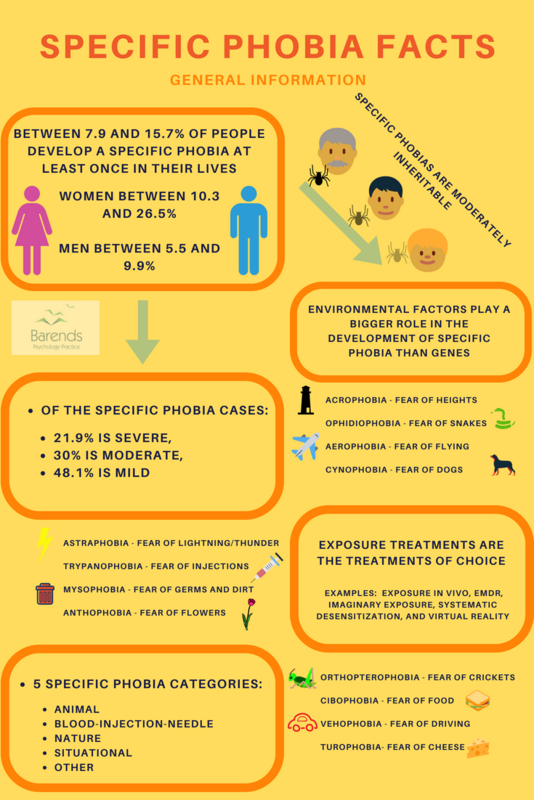 This page discusses all possible specific phobia symptoms and diagnostic criteria and accompanies them by examples or a detailed explanation. At Barends Psychology Practice, we offer (online) counseling for specific phobias. Contact us to schedule a first, free of charge, online session. (Depending on your health insurance, sometimes treatment can be reimbursed). This chapter discusses the specific phobia symptoms by looking at the diagnostic criteria for specific phobia. The italic text is added for clarification and contains the symptoms as described in the image on the right or above. What is the specific phobia symptom you suffer from the most? Experiencing less than 5 of these specific phobia symptoms is not enough to meet this criterion. However, it is possible that someone has not experienced enough phobia symptoms, because that person has been avoiding the phobic situation, animal or object. In that case, it is likely that this person will experience more specific phobia symptoms when he or she encounters the phobic situation, animal or object. B. The phobic object or situation almost always provokes immediate fear or anxiety. For example, someone with a fear of spiders (Arachnophobia) panics and starts screaming when there is a spider in the room. Someone with a fear of dogs (Cynophobia) may freeze and internally panic (experience a lot of anxiety and stress) when a dog approaches them. C. The phobic object or situation is actively avoided or endured with intense fear or anxiety. 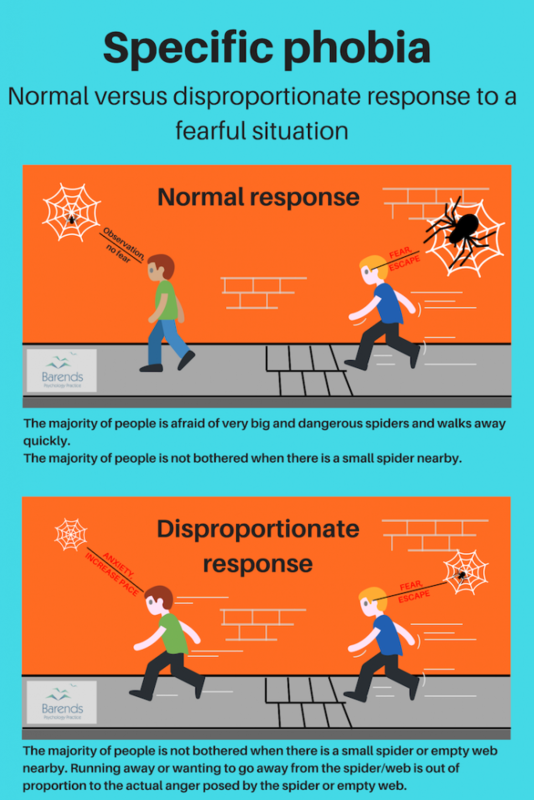 When someone with a specific phobia encounters the phobic situation, animal or object, that person wants to leave the situation early (as soon as possible), avoids approaching the animal, and will try to distract itself. Distracting oneself lowers anxiety levels in the short run, just as leaving the situation with the phobic animal or object. Unfortunately, avoidance does not work in the long run and it results in increased levels of anxiety and other specific phobia symptoms. For more information about the negative effects of avoidance, click here. Also, people with a specific phobia may try to avoid situation where they encounter the phobic animal, object or situation, endure the situation with a lot of stress and anxiety. Think of people who avoid going on exotic holidays due to a fear of flying (Aviophobia) or an someone with social phobia who needs to give a speech or presentation. It is common for these people to use tranquilizers to stay calm during the flight or speech. D. The fear or anxiety is out of proportion to the actual danger posed by the specific object or situation and to the sociocultural context. The classic image of a woman standing on a chair when she sees a mouse in the room is a perfect example of this criterion. Fainting or vomiting when seeing blood is another response that is out of proportion to the situation. Where in the first example the woman has control over her behaviour, in the second example the person has no control over the situation. E. The fear, anxiety, or avoidance is persistent, typically lasting for six months or more. This criterion changed when the DSM IV-TR was replaced by the DSM 5, and it is an arbitrary one. If someone suffers severely from the above mentioned specific phobia symptoms for three months straight, then we strongly recommend reaching out to a professional for treatment. Specific phobia treatment is also effective for people who meet the other specific phobia criteria. F. The fear, anxiety or avoidance cause clinically significant distress or impairment in social, occupational, or other important areas of functioning. If someone has social phobia, but functions well in their job and social life, then there is no need to reach out to a professional for treatment. If, however, someone with social phobia experiences a lot of the above mentions symptoms while interacting with coworkers, then it is important to reach out to a professional for treatment. Specific phobia symptoms typically do not improve the social interaction with coworkers and thus is it likely that enduring these symptoms will increase social phobia. It is even common to have a one or more traumatic experiences during these social interactions. G. The disturbance is not better explained by the symptoms of another mental disorder including fear, anxiety, and avoidance of situations associated with panic-like symptoms or other incapacitating symptoms (as in agoraphobia); objects or situations related to obsessions (as in obsessive-compulsive disorder (OCD)); reminders of traumatic events (as in post-traumatic stress disorder (PTSD)); separation from home or attachment figures (as in separation anxiety disorder); or social situations (as in social anxiety disorder). One may have noticed the overlapping symptoms with PTSD, OCD or Generalized Anxiety Disorder. Due to the fact that some of these symptoms are overlapping, it is important to rule out any other mental disorder. If, for example, someone with a fear of open water (Thalassophobia) almost drowned during childhood, it is likely that this fear of open water (and swimming) is the results of this traumatic experience. Applying trauma treatment on this experience will most likely significantly reduce or take away the fear of open water. Specific phobia treatment would be less effective, because there is a traumatic experience causing the ‘specific phobia symptoms’.